Enlightenment broadly means wisdom or understanding enabling clarity of perception. However, the English word covers two concepts which can be quite distinct: religious or spiritual enlightenment and secular or intellectual enlightenment. This can cause confusion, since those who claim intellectual enlightenment often reject spiritual concepts altogether. In religious use, enlightenment is most closely associated with South and East Asian religious experience, being used to translate words such as (in Buddhism) bodhi or satori, or (in Hinduism) moksha. The concept also has parallels in the Abrahamic religions (in the Kabbalah tradition in Judaism, in Christian mysticism or Gnosticism, and in the Sufi tradition of Islam). In secular use, the concept refers mainly to the European intellectual movement known as the Age of Enlightenment, also called the Age of Reason referring to philosophical developments related to scientific rationality in the 17th and 18th centuries. Enlightenment is man's release from his self-incurred tutelage. Tutelage is the incapacity to use one's own understanding without the guidance of another. Such tutelage is self-imposed if its cause is not lack of intelligence, but rather a lack of determination and courage to use one's intelligence without being guided by another. Qi-Chi-Ki (氣)"Energy Flow" -The etymological explanation for the form of the qi logogram in the traditional form 氣 is “steam (气) rising from rice (米) as it cooks”.Chi energy or life force circulates freely through a healthy human body, but becomes blocked in an unhealthy body by stress, causing illness and blockages in the meridians and Chakras (body energy centers). According to Chinese practitioners, the fundamental energy of Chi is said to flow through 12 meridians or pathways in the body, each associated with an internal organ and a functional body system. This means the internal condition of the body can influence the outer areas and actions and the outer areas can affect the regulation of the inside organs. These effects can be both beneficial and detrimental. Chi has a similar energy form as water and has to follow the same universal laws, as does any other form of energy. For the flow of Chi from one living thing to another, a set of conditions applies between the giver and receiver of the energy. General health of both giver and receiver determines the exchange of energy. The sick cannot heal the sick. As an example of the reciprocal nature of energy we can look at batteries. If two batteries were connected together so that the energy could flow between them; the universal law and principles say that the energy will flow from the battery with the most energy, to the battery with the least energy, until both batteries have the same balanced energy. However, if one of the batteries is damaged, the flow to that battery will be limited. This is similar to the bodies healing process. If your body was damaged, it may not accept energy easily. Everyone's potential healing energy or life force Chi level is different. There is no longer any doubt that when the Chi or energy of the body becomes low, the body becomes unhealthy. This applies throughout the whole body, right down to a cellular level. Medical researchers have found that when the energy level of a cell falls too low it becomes unhealthy and can even become cancerous or diseased. In essence, the Chi level in the "dis-eased" part of the body becomes unbalanced and would need energy restoration. The logical conclusion is that we ourselves need to use water and energy, as a "detoxifying recharge" to survive the rigors of everyday toxemia. The meanings have also been interpreted differently. Elements-The Chinese five elements are called gogyō (五行), and the Japanese five elements are called godai (五大). The following article explains the latter. The godai, lit. "five great", of Japanese tradition is perhaps best known in the West for their use in Miyamoto Musashi's famous text Gorin-no-sho (The Book of Five Rings), in which he explains different aspects of swordsmanship by assigning each aspect to an element. Chinese philosophy identifies 5 different ways that Qi manifests itself in the universe as the five elements.As with all things in the universe, the human body is influenced by the energies of these five elements. Any imbalances in the energies of one element will show in the organs and meridians dominated by that element. Each element is also associated with an emotion, a body part, a body outlet, a sense, a flavour, a sensation and a Season. The arrows pointing in a clockwise direction show how the elements interact with each other. Fire produces ashes to become Earth. Earth produces metal as ore. When metal is heated it becomes fluid (like water). Water allows wood to grow. Wood produces fire when burned. The arrows in the very center of the diagram show a control cycle of the elements. Too much of one element may lead to a weakening of the corresponding one. Mantras -can be interpreted to be effective as vibration, or more simply as sound, which may include verbal repetition, in the form of chanting, or internal mental repetition. For this reason great emphasis is put on correct pronunciation (resulting in an early development of a science of phonetics in India). Mantras can be used in Eastern spiritual traditions to divert the mind from basic instinctual desires or material inclinations, by focusing the mind on a spiritual idea, such as "I am a manifestation of divine consciousness". In English language usage, the term "mantra" has a colloquial meaning quite distinct from prayer —a meaning that carries interpretive (or misinteretive) and derogatory connotations found within Western religion's (ie. monotheism) negative view of Eastern religion (ie. polytheism) and many of its concepts. In short, "mantra" in English carries a negative connotation of 'mindless or thoughtless repetition of a concept,' similar to the negative connotations associated with the term "dogma." It is also considered to be a spiritually originated law.It is not punishment or retribution but simply an extended expression or consequence of natural acts. The effects experienced are also able to be mitigated by actions and are not necessarily fated. That is to say, a particular action now is not binding to some particular, pre-determined future experience or reaction; it is not a simple, one-to-one correspondence of reward or punishment.The effects of all deeds are viewed as actively shaping past, present, and future experiences. Meditation is a mental discipline by which one attempts to get beyond the reflexive, "thinking" mind into a deeper state of relaxation or awareness. Meditation often involves turning attention to a single point of reference. It is recognized as a component of many religions, and has been practiced since antiquity. It is also practiced outside religious traditions. Different meditative disciplines encompass a wide range of spiritual and/or psychophysical practices which may emphasize different goals -- from achievement of a higher state of consciousness, to greater focus, creativity or self-awareness, or simply a more relaxed and peaceful frame of mind. Meditation as been defined as: "self regulation of attention, in the service of self-inquiry, in the here and now." The various techniques of meditation can be classified according to their focus. Some focus on the field or background perception and experience, referred to by some as "mindfulness"; others focus on a preselected specific object, and are called "concentrative" meditation. There are also techniques that shift between the field and the object. To meditate, we need to understand two factors: evaluate the intricacies of the mind (how the mind works) and become familiar with awareness. Once we know how a thought is formulated, what triggers thoughts, what are the conditions in which mind is prone to generate thoughts, only then can we take a leap beyond the cobweb of thoughts and experience the ever-flowing bliss. To understand all this, we need to cultivate and nurture attentiveness, alertness, vigilance and have a sharp microscopic vision. Meditation can be practiced while walking or doing simple repetitive tasks. Walking meditation involves taking step after step, being aware of the movement, the gentleness, and the grace of the human body. Walking meditation helps break down habitual automatic mental categories, "thus regaining the primary nature of perceptions and events, focusing attention on the process while disregarding its purpose or final outcome." Meridian ( 經絡), also known as channel, in traditional Chinese medicine, is the common name of vessel, (also known as channel) and collaterals. It is the path of running qi and blood, connection zang-fu viscera, communication inside and outside, and run through top and bottom.The translation "meridian" is claimed to be improper for inaccuracy. It is from the techniques and doctrines of Traditional Chinese Medicine (TCM), including acupuncture, acupressure, and qigong. According to these practices, the body's vital energy, "qi", circulates through the body along specific interconnected channels called meridians. There is no physically verifiable anatomical or histological basis for the existence of acupuncture points or meridians. 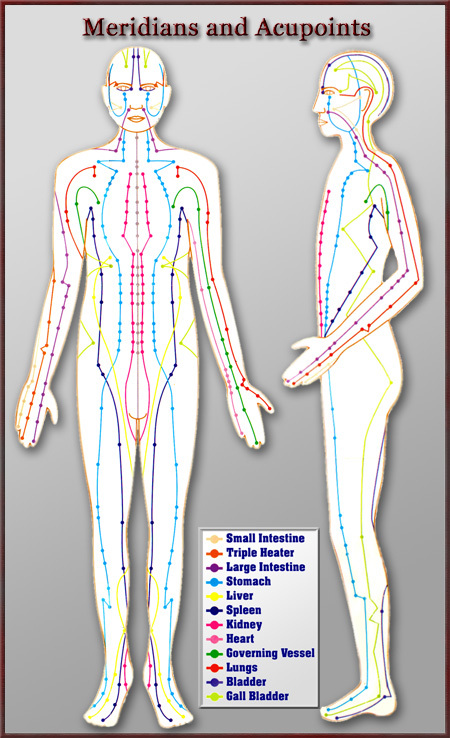 There are about 400 acupuncture points and 20 meridians connecting most of the points, however by the 2nd Century CE, 649 were recognised in China.Such 20 meridians are usually called the "twelve regular channels" or "twelve regular meridians" , with each meridian corresponding to each organ; nourishing it and extending to an extremity. There are also "Eight Extraordinary Channels" or "Eight Extraordinary Meridians" , two of which have their own sets of points, and the remaining ones connecting points on other channels. The twelve standard meridians go along the arms and the legs. They are: Lung, Large Intestine, Stomach, Spleen, Heart, Small Intestine, Urinary Bladder, Kidney, Pericardium, Triple Warmer (aka Triple Heater), Gall Bladder, and Liver. These terms refer to biological functions and not the structural organ, which is why there are some on the list with no corresponding anatomical structure. Meridians are divided into Yin and Yang groups. The Yin meridians of the arm are: Lung, Heart, and Pericardium. The Yang meridians of the arm are: Large Intestine, Small Intestine, and Triple Warmer. The Yin Meridians of the leg are Spleen, Kidney, and Liver. The Yang meridians of the leg are Stomach, Bladder, and Gall Bladder.